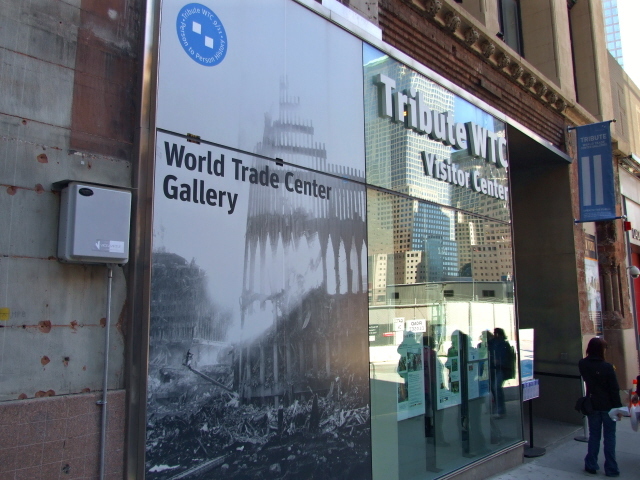 UPDATE: in June 2017 the exhibition was moved to a new, larger location and the Center was renamed "9/11 Tribute Museum" ... but the walking tours continue unchanged. A special commemoration effort run by the September 11th Families’ Association. They have a small but touching exhibition that pre-dates the main National 9/11 Museum, but continues to be operated in parallel with its newer and larger counterpart. The main focus of the 9/11 Tribute Center, however, is on guided walking tours around the Ground Zero area in Lower Manhattan, New York. The guides are all people who were in one way or another directly involved in the events of that day, either as survivors, rescue workers, eyewitnesses, or relatives of victims. This makes these tours the most personal (and also emotionally most intense) kind of memorialization of the tragedy that was 9/11. More background info: for general background see under 9/11, Ground Zero and National 9/11 Memorial & Museum. The Center/Museum was initially known as “Tribute WTC” and was first opened in September 2006, 5 years after the events of 9/11, 2001. It is a project of the September 11th Families' Association, a non-profit corporation first created by the families of the NYFD. Over the years, many survivors and people in other ways directly connected with the tragedy of 9/11 have joined the ranks of the guides who run tours of the area and relate their personal stories to visitors. 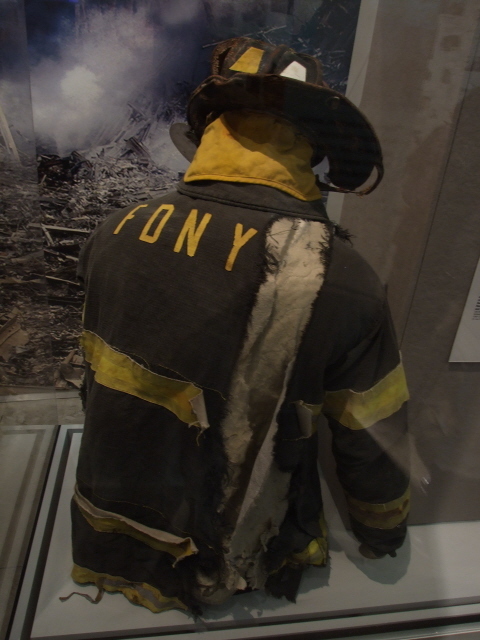 While the official 9/11 Memorial and its museum were under construction, the Tribute WTC's exhibition gallery and walking tours were by far the best and most comprehensive memorialization of this dark chapter in history. With the opening of the museum, the significance of the Tribute Center may have diminished in relative terms, but it is still an important part of the whole commemoration effort. And while its exhibition is necessarily much smaller than the new museum and thus cannot compete in terms of range and depth, the walking tours organized by the Center remain the most powerful way in which visitors can engage with the tragedy of the historic events in a very personal, emotional way. At the time of writing (February 2016), the Center has over 200 guides, so there are obviously countless different angles and emphases on these tours. This also means that you can go on these tours repeatedly and, provided you get different guides every time, will get more and more different perspectives on the subject matter. Few other guided tour concepts in the world can offer that degree of variety that makes repeat participation so worth it. I would certainly do it again next time I'm in New York and have the required time to spare (which last time, unfortunately, I did not). I do not know when the Center changed its name from the previous “Tribute WTC” to the current “9/11 Tribute Center” - or why this change was made. I can only speculate that it may have been done in order to bring the name more in line with the official National 9/11 Memorial. UPDATE: it's changed its name again, now to "9/11 Tribute Museum", probably because the exhibition at the new premises has been enlarged to warrent the designation museum after all. What there is to see – and hear: The 9/11 Tribute Center combines two thematically related, but by nature very different components: a) a static museum exhibition, and b) guided walking tours. Together they aim to relay “the story of 9/11 told by those who were there”, as the Center's slogan now goes. This obviously applies much more to the walking tours, but the exhibition also focuses more on personal angles rather than just cold facts. UPDATE: the description below is of the previous incarnation of this institution when it was still the Tribute Center. There are bound to be still many similarities, but the msuem has also been expanded. So read the following bearing that mind. The exhibition, called gallery here, is subdivided into five sections: “The Attack”, “Recovery”, “Those Lost”, “Healing”, and “The Future”. The first couple of galleries involve some stunning artefacts. 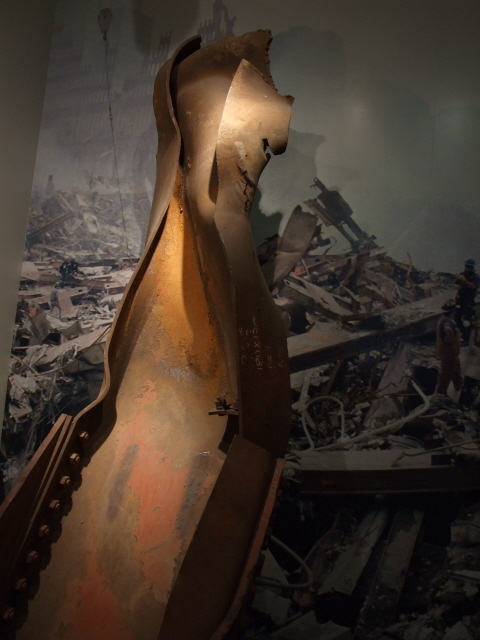 At the centre of a large photo panorama of the smouldering debris of the collapsed Twin Towers of the WTC is one original piece of a mangled steel beam recovered from the site. 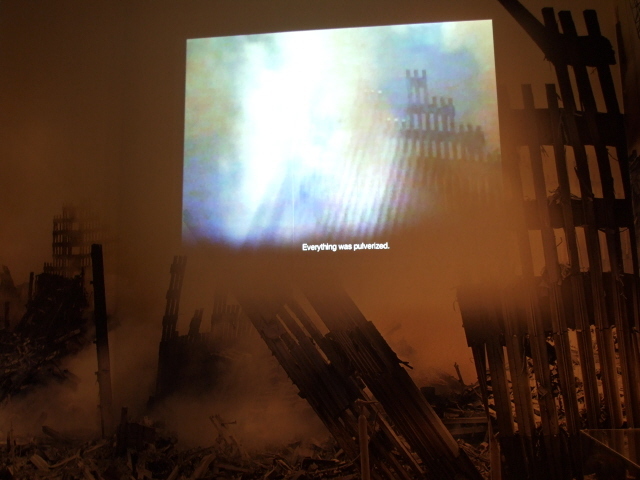 Above it a video projection provides an additional narrative compiled from personal reflections of eyewitnesses accompanying yet more images of the disaster. 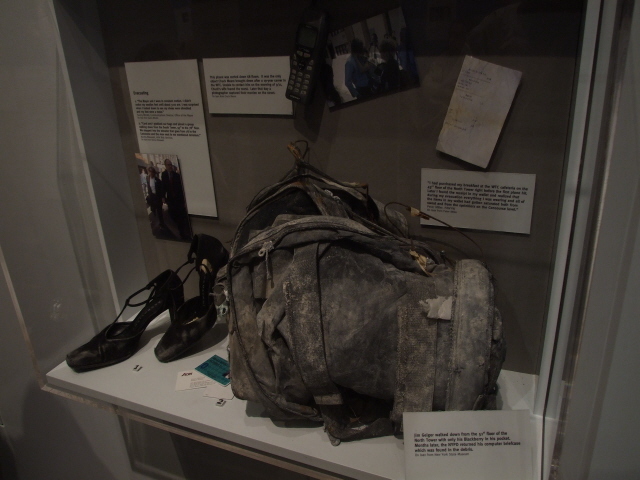 Also on display are various personal items recovered from the rubble, such as bags, mobile phones, shoes, and ID cards, and even a menu from the North Tower's “Windows on the World” restaurant on the 107th floor. Even more striking is the display of a window section of one of the hijacked planes that were flown into the Twin Towers. It is mangled, scarred and glassless. 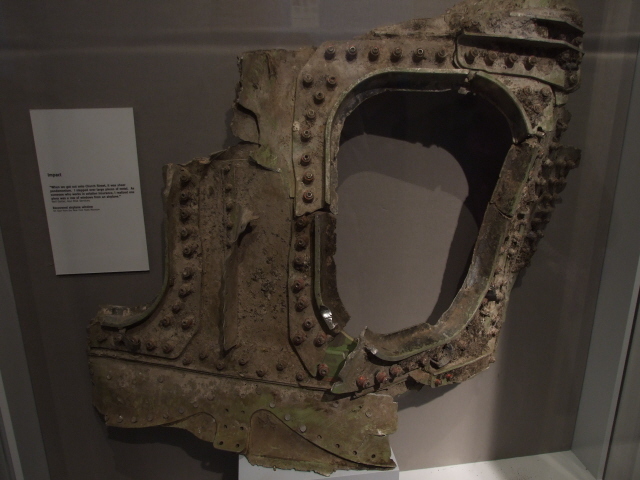 Apparently several such pieces were recovered from the site (the 9/11 Museum also has such a piece). Very grim too is the display of a firefighter's coat and helmet. The latter is one of only about a dozen recovered (out of almost 350 firefighters lost that day). The helmet is bent and blackened, but the coat is completely ripped lengthwise. It makes you shudder. 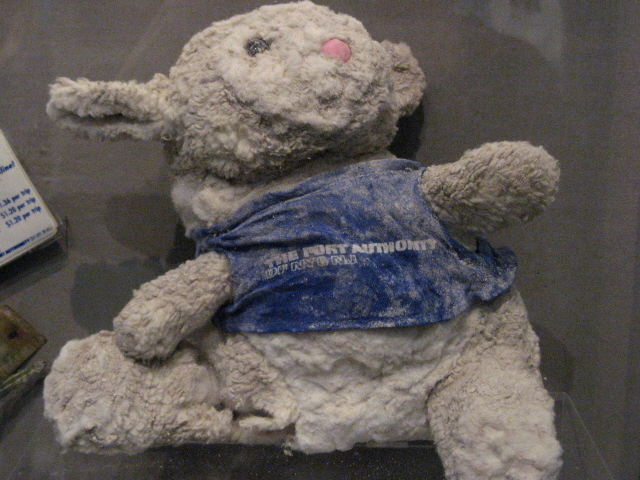 Perhaps the most heartbreaking exhibit is that of a dusty and battered fluffy toy lamb in a Port Authority of NY and NJ shirt. As the accompanying label explained, this was found almost intact on the top of the heap of rubble from the collapsed towers. How this could have “survived” when so many people didn't was the question the rescuers asked themselves. The “Those Lost” section is dominated by the display of amassed victims' photos and mementoes. You get an impression of how many lives were lost, while at the same time each one of them remains an individual story. 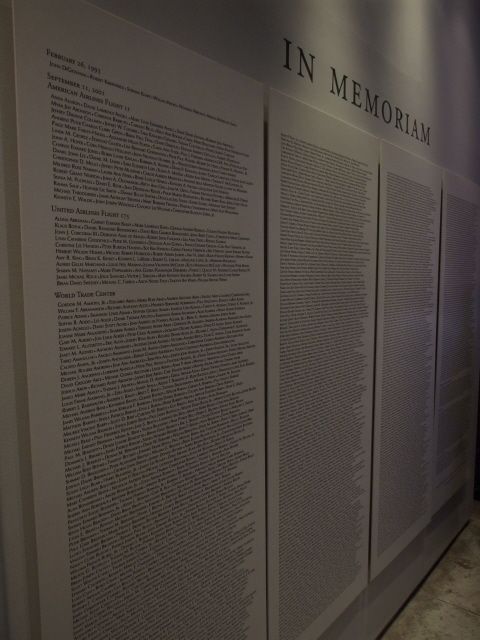 There's also a Wall of Names of all victims. Amongst the exhibits in the “Healing” gallery are strings of Japanese origami paper cranes, which had become symbols of peace in the wake of the A-bombing of Hiroshima. Most remarkably, there is an original such crane made by Sadako Sasaki herself, who as a radiation-induced leukaemia victim in Hiroshima in the 1950s had started the trend, before succumbing to the disease in 1955 (cf. also Hiroshima Peace Memorial Museum). The crane was donated to the Center by Sadako's brother in 2007! Also in this section is an overview of other 9/11 memorials and monuments around the world, many of which involve parts of the steel debris. When I visited, a major story was also the launch of a US Navy vessel named USS New York, whose bow was partly made with steel from the WTC! The Center/Museum also keeps collecting cards on which visitors can note down their personal feelings and thoughts about 9/11, the Center, the tours and so on. Many of these are also on display. As my first visit was several years ago, in April 2010, long before the official National 9/11 Memorial & Museum opened, I had been wondering what would become of the old Tribute WTC and whether the artefacts on display in its gallery would be incorporated into the new museum instead. But going by what you can see in the official intro video about the current 9/11 Tribute Center gallery, the items described above still appear to be there. The one section that will indeed have changed a lot, in contrast, is the “Future” gallery. When I was there this was mostly about the design of the new memorial and the plans for the museum. Now this has all opened, the focus seems to be more on the changing skyline of Manhattan as more and more of the new skyscrapers that replace the lost WTC Twin Towers are being constructed. The observation deck part of the already finished new WTC 1 will apparently also collaborate with the 9/11 Tribute Center (e.g. granting members of the Families' Association free entrance). UPDATE: it has meanwhile become absolutely clear that the Centre, now as the 9/11 Tribute Museum will continue to co-exist with its bigger, official memorial and museum. The more personal approach at the Tribute Museum clearly allows for such a dual commodification. I haven't seen the new and expanded museum yet, but will obviously have that as a top priority when/if I ever go back to New York. The focus of the 9/11 Tribute Center, and formerly the Tribute WTC, was and still is, however, on the personal aspects – of those who were directly involved. And this is particularly brought to life in the guided walking tours offered. These are conducted by survivors, family members who lost relatives, local residents, helpers who took part in the recovery work, etc., i.e. indeed by “those who were there”. Naturally, this makes these tours a very powerful experience. More than 200 volunteers are involved in this, most on a regular basis, and their individual stories naturally vary quite a bit – so what you hear on these tours, apart from the already rather familiar facts about the WTC and its destruction, will be different accounts, linked in various personal ways to 9/11 in more or less direct ways. When I went on a walking tour in April 2010 our group had two guides: one main guide who did most of the talking and at various locations showed us laminated photos to illustrate things often in a before-and after fashion (i.e. in a way the actual site these days can hardly do). The other guide's role was primarily to keep to the rear of the group (presumably to rake in any stragglers), but he also stepped forward at one point to tell his own story linked to the tragedy. The main guide had lost a brother, who was in the police force and who had rushed to the site straight after the first plane had hit on 9/11. His remains were never found, but it was established later that he must have been on the 22nd floor of the North Tower when it collapsed – no chance of survival, but at least it would have been quick, probably before he could have realized what had hit him. The other guide was an actual eyewitness/survivor and had an even more dramatic story to tell. A science teacher at a school on a block immediately around the corner from the old Twin Towers on Trinity Place, he was due to tutor a new group of students when the tragedy began to unfold. Some of the students on the top floor of the school saw the first plane hit the North Tower, and they all heard the second plane flying overhead and crashing into the South Tower. The teachers were already in the process of evacuating the seven-storey building. Our guide was the last to vacate the school building and was heading for Battery Park with his students when the first Tower collapsed. The cocktail of chemicals from the WTC's collapse, including asbestos, still has long-term health effects, though – and our guide too reported in private conversation afterwards that he is still suffering from the after-effects, saying almost apologetically "my lungs certainly aren't what they used to be". He was also relatively fresh to guiding tours as part of the Tribute WTC project – it had taken him all those years before he could bring himself to participate in this way. All this gives the visitor a profound insight into how deep the emotional scars still are – and how these guiding tours even serve as something like therapy for the guides themselves. The guides even profusely thank their groups for having taken the time to go on one of these tours and for having listened to their stories! And there you stand in awe just thinking: no man, thank YOU for sharing all this with us! 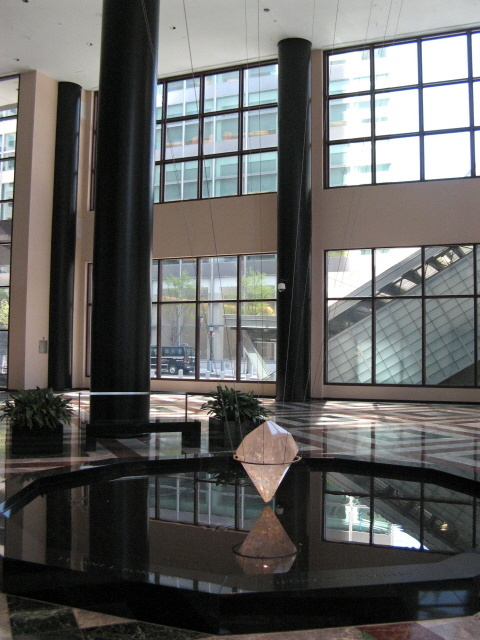 The tour I was on ended in the winter garden foyer of the World Financial Center with its impressive “Eleven Tears” monument that commemorates the eleven lost colleagues of a particular company (I chose to avoid giving the name here). From here we walked back, and the guides were answering questions, until we parted at the entrance to the Tribute WTC gallery again. In the foyer of the Center is also a medium-sized museum shop that sells various books, DVDs, photo prints, T-shirts, postcards and fluffy toy dogs in blue shirts with the Center's logo on them. While the 9/11 Tribute Center (now '9/11 Tribute Museum') and its walking tours can hardly replace a visit to the actual official 9/11 Memorial & Museum, they are certainly a very worthwhile addition. Doing the walking tour in particular is the most powerful, intense and personal experience relating to the historic events of 9/11 that you can get – something that the museum and memorial alone cannot offer. Location: UPDATE: no longer at 120 Liberty Street, but NOW at 92 Greenwich Street, Lower Manhattan, New York, a bit further south, but still only a short walk away from the National 9/11 Memorial complex. Details: The 9/11 Tribute Center/Museum is just round the corner from the main National 9/11 Memorial & Museum, no longer just a few steps away (as at the previous location), but now some 350 yards further down the road on Greenwich Street. It's right opposite the subway station Rector St (lines 1, R). But it's still easily walkable from the main memorial as well. Opening Times: Monday to Saturday 10 a.m. to 6 p.m., on Sundays to 5 p.m. only – last tickets sold half an hour before closing. Guided walking tours outside + admission to museum gallery: 35 USD. Audio guides, still on offer when I was there, no longer seem to be provided as an alternative. I never used one anyway, so I can't say if that's a big loss or not. It probably makes more sense to go with a live guide anyway. Tickets for both guided tours and just admission to the gallery alone can be pre-purchased online through their website (which has now also changed to 911tributemuseum.org), or you can just turn up at the Museum and try your luck. But this can mean that you have to wait for a time slot later in the day, or even that you won't get on any that same day if they are already fully booked. Tours are limited to a maximum of 20 participants. What does NOT seem to be an option is just booking a guided walking tour without admission to the gallery exhibitions. This is a shame for those who just want to come for a repeat visit to hear a different guide's story on the walking tour but don't need to revisit the gallery again. Offering the option of just joining a regular tour for a fee lower than the combined ticket price of 35 USD is something the 9/11 Tribute Center should consider for the future (I as believe that actualy had done at some stage in the past). Time required: The walking tours take about one hour 15 minutes (add to that a bit of extra time for gathering the group, Q&A afterwards and walking back to the museum – or onwards to wherever you may be heading next). Viewing the gallery/exhibition is said to take about 45 minutes, but I found that an optimistic estimate. Especially when there are a lot of people in there (as was the case when I visited) you have to factor in long waiting times before you can move on and have your turn at viewing artefacts, reading texts or watching videos. Combinations with other dark destinations: see under Ground Zero and New York City in general. Combinations with non-dark destinations: see under New York City.